Ranking as one of the top banks in America, you are making the right choice banking with Chase! Opening a new Chase Premier Plus CheckingSM offers you the potential to earn a Chase $300 Bonus by applying online OR requesting a coupon online and visit in-branch to open your account! With 16,000 Chase ATMs and nearly 5,000 branches nationwide, convenience is on your side! Earn a Chase $300 Checking Bonus today! Below is all the information and details you need to earn your Chase Premier Plus Checking Bonus! 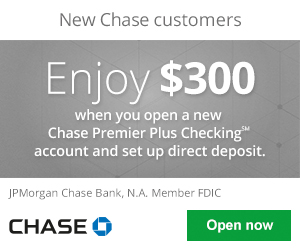 To earn your Chase $300 Checking Bonus, simply open a new Chase Premier Plus CheckingSM Account in-branch or online. Be sure to enter your email on the offer page to receive a Chase Total Checking® Coupon from chase to redeem this bonus offer in-branch. Early Termination Fees: Must wait at least 6 months, otherwise $300 bonus will revert back. Promo Code(s): Must enter email on online promo page to receive coupon offer to bring in-branch OR apply online. Chase Premier Plus CheckingSM: If you are eligible for this bonus offer, simply request your coupon online then visit your nearest branch to open a new checking account OR apply online and earn your Chase $300 Bonus! The next step is to set up direct deposit to your Chase Premier Plus CheckingSM within 60 days of account opening. After completing these requirements, Chase will deposit the bonus in your new account within 20 business days. Save Money. Planning ahead can be tough, but these account features will help you save. Perfect for everyday use. Enjoy no-fee reloads, directly from your smartphone. Bank On Your Schedule. Chase is committed to making day-to-day banking as convenient as possible. Withdraw cash at one of our 16,000 Chase ATMs. Access account information and banker guidance at one of the near 5,000 branches. View account activity, transfer funds and more using the Chase Mobile® app or on chase.com. Deposit checks from virtually anywhere, anytime, just by taking a photo with our Chase Mobile app. Manage Your Finances. Whether you keep track of the funds at home or at work, this account can help you manage. Save time: Use your Chase Mobile® app to add payees, schedule payments, and view account activity on the go. Pay bills conveniently: Use Online Bill Pay for rent, mortgage, utilities, credit card bills, car payments, and other monthly bills. Easily track all transactions made from your account with the Chase Mobile app or online. This Chase Premier Plus CheckingSM bonus is very easy to obtain. I personally bank with Chase and have been a satisfied customer ever since I opened my account. Chase is very convenient for me and there is either a branch or ATM within good range from wherever I may be. Definitely make Chase Bank one of your top choices when you’re deciding on switching banks or opening your first account.